Although the basic Greek Avgolemono recipe is relatively simple, experience has shown me that it can be really tricky. If you have ever tried making your own Avgolemono (egg lemon sauce) before lots of things can go wrong leading to a disaster! The most common mistake is that the Avgolemono – egg lemon sauce curdles and gets lumpy. To prevent you from making the same mistakes I have put together this short and simple guide to the perfect Avgolemono sauce and help you succeed every single time. Avgolemono (egg-lemon sauce) is a delicious Greek sauce which is widely used in a variety of Greek dishes, from meatball soup, chicken soup, to Greek-style fricassee, stuffed cabbage rolls and the list goes on. This Greek Avgolemono recipe is so versatile that it can be used with almost everything! Egg-lemon sauce (Avgolemono) is the secret ingredient to finish of all these Greek dishes, as it acts as a thickening agent, giving a unique taste, creamy texture and a nice, tangy homely flavour to them. 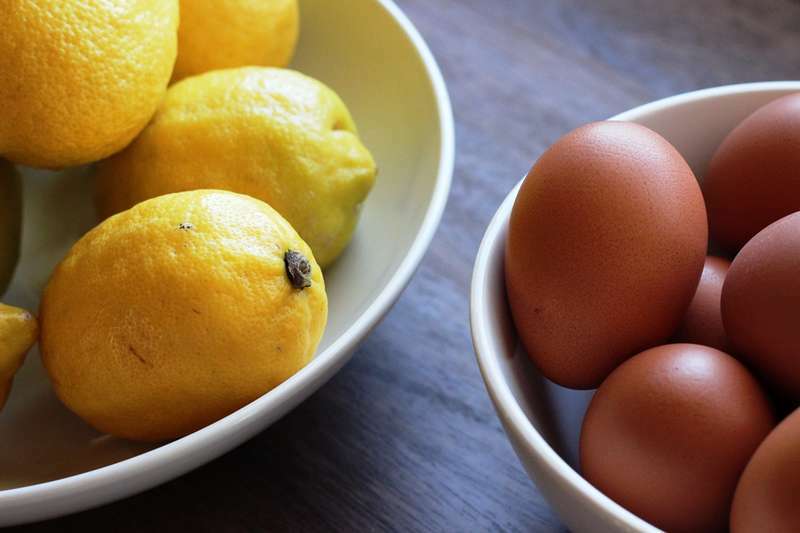 To make the traditional Avgolemono recipe (egg lemon sauce) you will need 2-3 eggs (at room temperature), the juice of 2-3 lemons (depending on how lemony you want tour sauce to taste) and some broth. The base ingredient for this Avgolemono recipe is the broth, which is made with the left over juices from whatever dish you’re cooking and cannot be prepared on it’s own. Juicy dishes like chicken soup or stuffed cabbage rolls are ideal for this egg lemon sauce as they produce a rich in flavour broth which is perfect for this Avgolemono recipe. To prepare the classic Avgolemono recipe, start by cracking the eggs into a bowl and whisk well. Gradually add the lemon juice and whisk again to combine. Add a little of the warm stock or soup and whisk quickly, add more and whisk again. The reason for slowly adding the broth is to gradually warm up the eggs so you don’t end up with an omelette instead of a sauce! Pour gradually the egg mixture back into the pot, whilst constantly stirring and bring just below boiling point. Remove the pan from the stove and serve. If you haven’t tried making an Avgolemono recipe before, I have a little trick for you that will make your egg-lemon sauce impossible to fail. You will need the same ingredients as in the basic Avgolemono recipe with the addition of 1 tsp of corn strarch. Into a bowl add the lemon juice and 1 tbsp of water, add the corn starch and whisk well until dissolved. Crack in the eggs and whisk very well. Add slowly some of the warm stock or soup and whisk quickly, add some more and whisk again so that the eggs warm up. Then pour gradually the egg mixture back into the pot, whilst constantly stirring and bring just below boiling point. Done! The perfect egg-lemon sauce (Avgolemono) recipe! This is the technique I use most of the time when making a Greek egg-lemon sauce (Avgolemono). It may take a little longer to prepare but it results in a creamier version of the sauce which is well worth the trouble! Start off by separating the egg whites from the egg yolks. In a bowl, whisk the egg yolks and gradually add the lemon juice whist whisking until combined. In another bowl add the egg whites and whisk using a hand mixer until the egg whites are foamy and thick. While whisking slowly add the yolk mixture in the egg whites. Continue whisking for 1-2 minutes and gradually add some of the hot broth, a litte bit at a time. Make sure you add the broth slowly or the egg whites will curdle! When done, pour the mixture back into the pot, stir well and leave for 5-10 minutes. If the dish you are preparing is not a soup and contains pieces of meat, in order to achieve the very best texture on your Avgolemono sauce, you should separate the meat from the broth, strain the broth and place in a separate pan. Then prepare the egg lemon sauce in an other pan and combine with the meat at the end. Serving with some crusty bread and digging into that delicious sauce is one of the reasons why I love this egg-lemon sauce! So don’t forget to get yourself some rustic, crusty bread and enjoy an amazingly tasty experience!